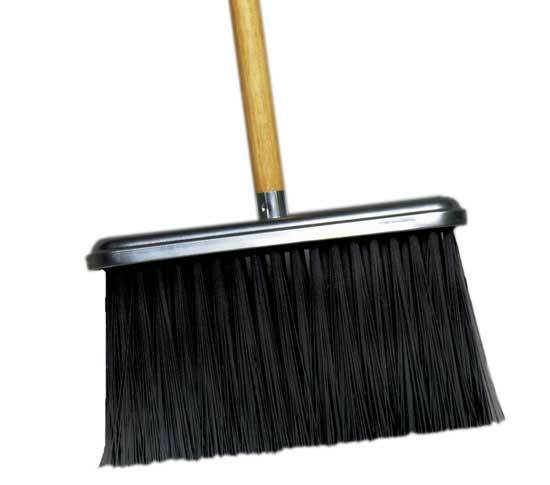 Brooms are bristled, long-handled cleaning brushes used for the collection and disposal of dust and debris in places of business, homes and in public spaces. Brooms are the most limited of all brush varieties in terms of their use on an industrial scale. Brooms Brooms are bristled, long-handled cleaning brushes used for the collection and disposal of dust and debris in places of business, homes and in public spaces. Brooms are the most limited of all brush varieties in terms of their use on an industrial scale. Traditionally, brooms were made of stiff, fibrous organic materials, which ranged from dried grass to sorghum, and which were tied to a handle. In many developing countries, particularly in sub-Saharan Africa, such broom compositions are still very common. In more developed markets, brooms may still be composed of organic bristles, but they are efficiently assembled and woven together in factories. 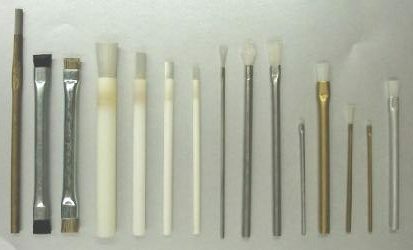 Brooms – Gordon Brush Manufacturing Co.
Other broom varieties can feature synthetic bristles, many varieties of which are made of Nylon, PVC or tampico. Each variety features different qualities of stiffness, durability and liquid absorbency. Softer fibers, for example, would be more useful as push broom bristles in an auto repair shop because they are better able to absorb oil or fuel spills in small quantities than are less absorbent, rigid bristle materials. Brooms can be assembled in a few configurations. The most common variety is the traditional sweep broom. A sweep broom is a collection of bristles connected directly to a handle. The bristles can be simply tied around the handle, as is the case with besom brooms, or they can be tied around the handle and fanned out into a flat shape by weaving them. These brooms are swept back and forth manually and are a good tool for sweeping small areas. 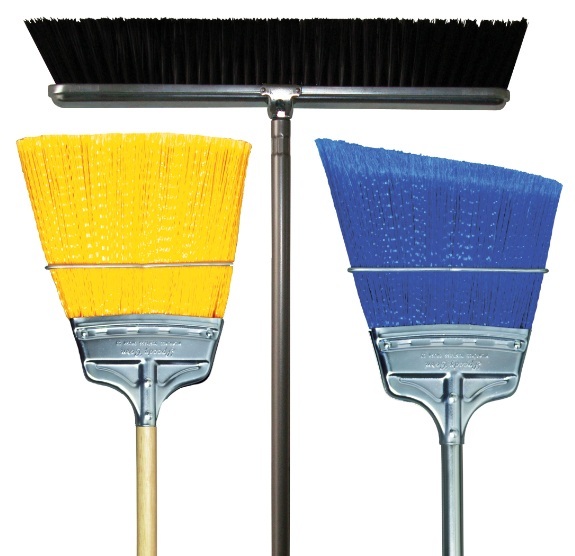 These two broom varieties are not the most ergonomic and can cause neck and back discomfort after sustained use. Push brooms all but eliminate this problem and allow for the effective sweeping of much larger areas. Push brooms differ from traditional sweeping brooms in that their bristles are connected to a strip or block-shaped mounting surface. The mounting surface can be connected to the handle by fasteners, or it can feature a threaded inlet into which a threaded handle can be screwed. Push brooms can be up to several feet in width, which allows their users to sweep large areas in a relatively short time.